October 26, 2017 | Submitted by: CityScapes Inc.
There’s often a lot of ugly-looking equipment on the rooftops of commercial and industrial buildings. It’s tempting to think because these are high up on a roof no one is going to see them, but they can. When viewed from a distance or from adjacent buildings, these unsightly units and features detract from the look of your company. Ugly rooftop equipment can negatively impact your brand identity, especially when nearby competitors have invested in screening. The appearance of your building’s façade and how it looks to prospects, customers, and partners, is an important consideration to bear in mind. Electrical, heating, and ventilation equipment are inevitable features of most buildings yet they don’t need to remain exposed for all to see. Attractive rooftop screens can hide a wide range of roof-based equipment you might never have considered important to conceal. What equipment are we talking about? Here are eight examples of rooftop equipment you can effectively hide with roof screens. HVAC units provide temperature and climate management for interior environments. The units are usually bulky and not particularly appealing to look at, especially when in rows. 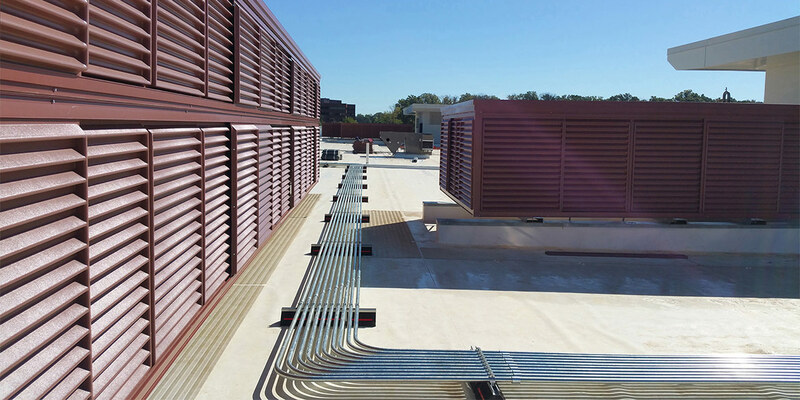 Roof exhaust fans pull air out of a building allowing fresh air to enter into the interior. The larger the building the more numerous these silver or grey metallic units need to be. Rooftop cooling towers reduce the temperature of water by extracting unwanted heat from various sources, including HVAC chillers. They are, at best, bland in appearance. Worse, if they start to rust. An inevitable feature of HVAC equipment and similar units are the ancillary ducts and pipework. These can often be seen from ground level especially when connected to high-level wall-mounted equipment. Walkways allow equipment to be accessed on rooftops. They’re ideal for non-flat surfaces and also for potentially slippery conditions. Walkways include step-overs for access across ducts. They are highly functional yet unsightly if near the edge of a roof area. Platforms raise equipment above the rooftop surface level and in so doing make both the framework and the equipment potentially more visible. These platforms usually come with guard rails, which add an extra visually distracting feature. Cellular communication systems, satellite dishes, antennas, and numerous other devices are features on rooftops throughout the country. It can be difficult to hide the tallest antennae but screens can certainly hide the bulkier devices below. These are just some of the equipment you can find on commercial and industrial rooftops. When viewed from a distance or from adjacent buildings, you can see why they might detract from the appearance of the premises and company brand. With so many varied screen designs and materials available nowadays – including our Envisor Rooftop Screens – it’s so much easier to dramatically improve the look of your buildings. Instead of seeing ugly industrial rooftops crowning your company, your customers will instead see smart-looking screens matching the general appearance of your building and the surrounding environment. The screens can even be adorned with your company brand logo.